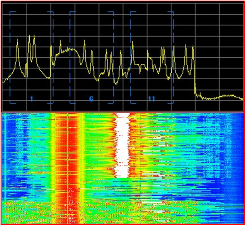 Detecting and identifying radio transmitters in the Wi-Fi bands is an art. Gaining skill at this art requires knowledge and practice. Thankfully, there are tools that help us along the way by providing automated device identification, and those tools are becoming more sophisticated. But, there are different ways to skin the proverbial cat, and as new methods and features for device identification come to market, understanding how they work is the first step in determining their value. Let's take a quick look at the different ways to identify and classify RF transmitters with a spectrum analyzer. With manual identification, the field engineer manually interprets the spectrum data—charts and plots—to identify patterns and use his or her knowledge and experience to classify the source. At CWNP, we encourage WLAN engineers to practice and develop manual classification skills because an engineer with these skills can answer questions that spectrum analysis software cannot answer. The primary advantage of manual classification is that the experienced engineer will have the capability to characterize and respond to any type of RF problem; he or she is not entirely dependent on the capabilities of the analyzer software. Spectrum troubleshooting does not always fit in a box, and device identification is often only the initial step in troubleshooting. In some scenarios, identification of the transmitter is sufficient for solving the problem. But, more commonly, identification of the transmitter is only a small step in fixing the network. An engineer with an intimate knowledge of RF patterns and behavior will be able to quantify the impact that an interference source will have on Wi-Fi operation; or perhaps the engineer will be able to dismiss a source of interference if it is inconsequential. In any case, manual identification relies on the expertise of the engineer. For that reason, it’s a more expensive skill to keep in house, but it’s also more valuable. This is the original type of automated device classification. Most spectrum analyzers used for Wi-Fi have some database of device types, which are matched with their transmit patterns. When the analyzer detects a specific RF pattern that matches an entry in its database, the software can positively identify the type of transmitter. Each spectrum analysis product has a different database for automated classification, where some products have limited auto-identification and others have very extensive lists of transmitters. The analyzer’s ability to identify a transmitter varies as a function of the analyzer’s scanning pattern, spectrum resolution, software engine, and other parameters. The analysis software includes generic explanations to inform the user about the interferer’s possible impact on the network. Automated identification features can usually categorize devices within a class, such as “video transmitter,” “microwave oven,” or “Bluetooth.” Fully automated device identification is ideal for inexperienced analysts and first response field staff. Custom device signatures are a relatively recent feature addition for Wi-Fi spectrum analyzers, giving end-users the option to add manually recognized patterns to the database of device signatures. When the user consistently encounters a source of interference for which a fully automated (Type 2 in this article) classification is not available, the user can define the pattern and label it with a classification. In other words, if the user observes an interference pattern and the software cannot identify it by default, the user can highlight that transmitter’s signature (usually by referencing a section of frequency displayed on one of the spectrum plots) and add it to the database of patterns. The benefit of custom device signatures is to share knowledge of interference sources. In large organizations with many spectrum analyzer users, an experienced engineer can create a custom signature that could be shared with other, less experienced engineers. Drawing on the database of custom signatures, the less experienced engineers could benefit from automated classification of common interference sources in their environment that are not natively identified by the spectrum software. The same benefit applies to different organizations whose IT communities cooperate. For example, engineers from different medical organizations could share their custom signatures with one another, attempting to reduce troubleshooting time when an unclassified source of interference is present. When a spectrum analyzer detects a repeated transmit pattern but cannot match it with a pattern in its database, the software can notify the user that a consistent, unclassified pattern has been detected. The software will alert the user, allowing the user to identify and label the unknown pattern—perhaps requiring the user to first discover and identify the source. After the user matches the pattern with a device name, the software can then automatically identify it. The benefit with this approach is that spectrum analysis software is often much better at detecting consistent patterns than engineers. A subtle, harmful source of interference may be present and may go unnoticed by manual analysis and by traditional automated identification. Though a complete network outage caused by interference will certainly be noticed by users and network staff, a less obtrusive source of interference could be hindering network performance without notice. Automatic pattern recognition is one more opportunity for engineers at all skill levels to “clean up” their RF spectrum. And even when there’s no clean-up to be done, automated pattern detection can be helpful for labeling the consistent sources of RF energy in network environments. This type of automated identification is new to the WLAN industry. To date, automated pattern detection as described in this section is only supported by Fluke Networks’ Spectrum XT. Spectrum analyzers give us a visual representation of the radio spectrum, but we still need skilled engineers that can interpret what they see. Good analysis software with automated identification features are helpful for less experienced engineers; more advanced pattern recognition features can also improve troubleshooting workflow for experienced engineers in an organization. These features can add a lot of value. In the end, we still need educated engineers that can use the tools, interpret the data, and apply the results to a network.